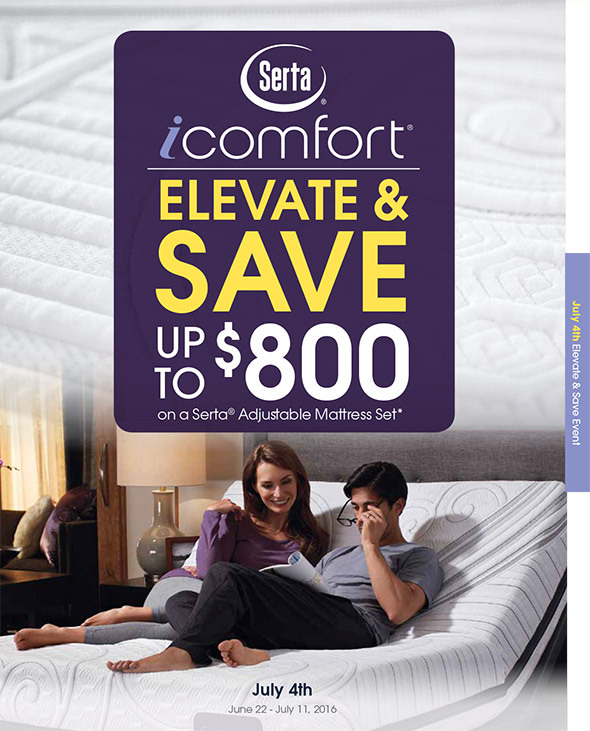 *Save up to $800 on select iComfort® and iComfort® Hybrid adjustable mattress sets purchased between June 22, 2016 and July 11, 2016 at participating retailers in the 50 United States and the District of Columbia. Offer is available only on qualified iComfort and iComfort Hybrid mattresses purchased with a Motion Perfect® III or Motion Custom® II adjustable foundation. Actual savings amount varies by mattress and adjustable foundation model and size. Offer available only on qualified purchases made at participating retailers while supplies last. Product availability, pricing and offer dates may vary by retail location. © 2016 Serta, Inc.